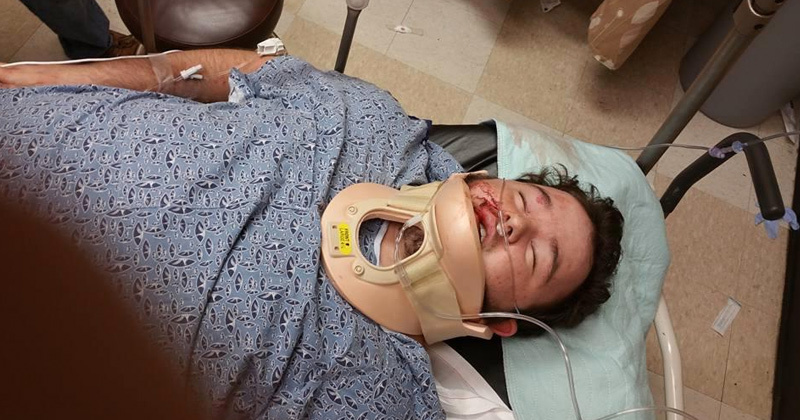 A 17-year-old Alabama high school student is in critical condition after being assaulted this weekend. According to Sylacauga Police Chief Kelley Johnson, Brian Ogle was assaulted in an Ace Hardware parking lot following Sylacauga High School’s homecoming game on Friday. When authorities arrived on the scene, they discovered Ogle beaten and bleeding from the head. He was airlifted to the University of Alabama Birmingham Hospital where tests revealed three skull fractures and trauma to his shoulder. “Instead of us planning for his 18th birthday, we’re here,” Brandi Allen, his mother, told a local Fox affiliate on Sunday. “Why? Because he made a statement that he backs the blue? I’m still trying to understand how someone, no matter the color of their skin, can do this to another human being. Chief Johnson told the station that witnesses to the assault described a group of black teenagers who are now persons of interest in an investigation. I guess, in a way, it's a bit like the Charlie Hebdo mess. When you provoke a group of ignorant thugs, having the free-speech laws on your side won't prevent bodily harm. I paraphrase someone else's analogy with traffic: when you use a crosswalk without looking both ways, you might still get obliterated by a car. Yes, you would have the right of way, but it'd be academic at that point because you'd be killed. Bingo, actions do have consequences. All this does is give a propaganda coup to copsuckers and make the job of peaceful people like Copblock and Photography is Not Crime that much harder. I've been saying it for years, police accountability leaders need to dissociate themselves from BLM. They're not really interested in the mission that organizations such as copblock built several years ago.